The Legendary Great White Shark; a name that strikes fear in many, mostly because of the myths surrounding its very being and how to defend yourself against the 300-toothed creature. While some of these myths are great to keep the landlord of the ocean shrouded in mystery, most of them are just plain preposterous. For example, it really is more likely that you’ll be killed by a shark than a fatal falling coconut rather than the other way around. Because of that debunked myth, it’s important to familiarise yourself with the following ways to defend yourself, should a shark decide to familiarise himself with you. The idea that the shark will simply let you be if you play dead is a farce and if anything it will make it easier for the shark to enjoy dinner. Kick, punch, do whatever necessary to create as much resistance to the shark as possible. Playing dead and submissive will also possibly place you in a horizontal position which is the easiest way for a shark to grab you. 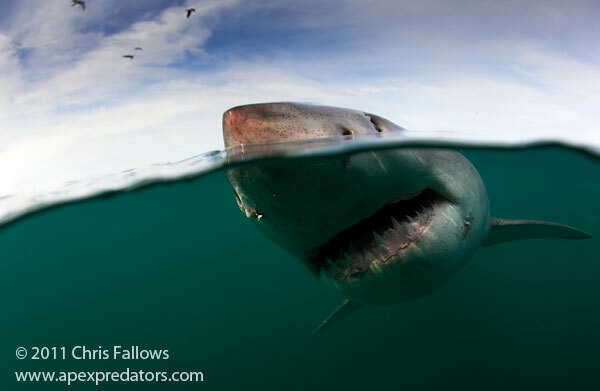 By maintaining a vertical position you are playing the sharks snout against him as it will get in the way as he moves in for a bite. This is probably the greatest myth that people believe to be false. It is in fact, true. A shark’s snout contains Ampullae of Lorenzini – a sensory organ that enables the shark to pick up electromagnetic fields in the water around them. However, a simple firm punch to the nose will disorientate the shark, allowing more time for you to get away. Unfortunately, in the ocean all humans really are fishes out of water and its unlikely that you would be able to keep up with the shark and be aware of its whereabouts at all times. The best way to solve this problem would be to swim towards a surface where you only have to worry about the shark attacking from a single direction. Unfortunately if you’re swimming in False Bay where there is little surface to prop yourself up against, you are going to have to make another plan. Shark bites instantly cause the body to go into shock which would make it incredibly difficult to actually swim to shore. However, one thing to remember at all times is that sharks are attracted to the smell of blood, which means you need to get out of the water as fast as possible. The best option is to not get bitten at all. The only way to really protect yourself during a shark encounter is to do a shark-cage dive. Great White Sharks are incredibly curious, a trait that has provided them with a very good understanding of the difference between a seal and a surfer. Scientists have observed that when attacking its prey, such as seals, they attack from the bottom up and throw the unsuspecting victim into the air. This is significantly different to the way in which they are known to attack surfers; a style that’s been documented as more of a stealthy, slow and quiet attack. However, surfers aren’t the only ones who should be wary. If Jaws has taught us anything, it’s that Great White Sharks like swimmers just as much. This entry was posted in tourism and tagged Apex Shark Expeditions, Cape Town, Great White Sharks, sharks, white shark by synergize. Bookmark the permalink.